On January 7, 2011 Imam Omar Hazim gave a very uplifting sermon titled Cultivating the Garden of our Souls, at the Islamic Center of Topeka. Omar began by stating that, in the adhan (call to prayer) that the brother recited at the beginning of this service, he mentioned “hiyya ala falah;” which means rush lively to success. Hiyya means rush lively, and Falah means success. Together they are calling humanity to cultivate our lives; develop self. Falah further means to unfold something to reveal the properties within, commented Omar. Just as the farmer cultivates his crops for the best produce so most we cultivate what is real within us. So five times a day during the call to prayer we are encouraged to evolve the self by using what G-d has put in us and manifest out potential, stated Omar. The Quran is full of wisdom for those looking to be successful. Quoting Imam W.D. Mohammed, Omar states, “we should follow wisdom to its logical conclusion.” Quran comes from Qaraa which means to read a written thing. A book which is meant to be read, recited and rehearsed. So we rehearse the Quran over and over again. For if we rehearse and practice it over and over again we will gain some of its wisdom, stated Omar. This verse also affirms the prophethood Of Prophet Muhammad (PBUH). G-d uses the word Tanzilul for sent down; He uses the same word for sending down rain. Thus nothing in the creation came down on its own but G-d has sent it and protects it. As he does the Quran, affirmed Omar. G-d swears by all that you see; as in that which we are endowed with understanding to comprehend. G-d is swearing by all that we see and witness as the entire perceivable creation. Then He swears by what we don’t see. We don’t see G-d, success, or what is in us. Even the scientist state there is ninety percent of the universe that we don’t see, continued Omar. So what is all this swearing about, asks Omar. That this Quran is true and that Prophet Muhammad (PBUH) is an Honorable Messenger. Quoting Prophet Muhammad (PBUH) Omar said “Every day the sun rises to bring about another Day, The Day says ‘oh children of Adam I am a new day and I witness what you do so make the best of me for you will not see me again until the resurrection.’” So whether you are striving for success of forgiveness every new day is a day to work towards your pursuit and start anew, encouraged Omar. Omar, quoting Quran, says, “Think! For surely you progress by the power of thought.” G-d put in the Quran over 811 times dhikr (think). Also in the Quran equally is Amana (Faith). So G-d is telling us to be successful by reasoning and having faith. These two things go together; faith and reasoning. “Success and failure are generally related to the habits we form,” stated Omar. The thoughts that we think they produce our action. Then that action produces a habit. Habits will produce a characteristic and that characteristic will determine our destiny, continued Omar. So if we want a business that is going to be successful then we want to perform the habits for that business to be successful. In chapter 6:125 of the Quran, Omar continued, when G-d wishes to guide us He expands our chest. The word for chest is sadurr but usually refers to the heart. So G-d puts faith in our hearts. So we all have a gift from G-d called faith that He put in our hearts. So faith is put in out chest as Islam. And the Quran gives us a desire to be successful, stated Omar. “So Islam is not in our clothes, in our skin, country we originated from, but it is in our hearts,” said Omar. It’s important to know that G-d believes in something according to one of His attributes. This attribute is Al –Mumin, the Guardian of Faith. Thus G-d believes in his creation. G-d believes in all of us, and knows what we are capable of said Omar. When G-d was about to create man the Angels ask G-d if he was going to create something that will spread mischief in the earth. But G-d told them that He knows and they know not and that He created us in the best of molds. We are not created in sin. We are created to bring forth out of us the best. “Not to die with our song still in our hearts,” stated Omar. Often we go into business and have a failure and we are ready to close the door. “Persistence is one of the key ingredients to being successful” and the Quran states that we should be patient and persevere, stated Omar. G-d is with those who are patient and persevere. Even if we don’t see the success in our life time we understand that it might be successful in our children’s lives. Thomas Edison failed at creating a lamp that would operate by electricity 10,000 times. But he did not call them failures, he stated that he learned 10,000 lessons why those things did not work, he kept at it until he succeeded. Also the early Muslims stayed in Mecca with Prophet Muhammad ten long oppressive years. Not fighting back until the revelation came to the Prophet (pbuh) to defend them self. It was the mystical power of faith and persistents that allowed them to be that strong. W.D. Mohammed once received a call from people who stated that if he left his house that day he would be killed. However he had work to do at home and was not planning on leaving. But because of the threat, he left his home, and drove all around town. Something he never does, just to answer that threat and show his faith, how nothing happens unless it’s by G-d will. The importance of possessing some of the Attributes of G-d, is illustrated in this story, began Omar. Adam, after being forgiving for his mistake, was told to look to his right. He saw three lights. He asked the first light, “What is your position and station? The light responded, “My position and station is in the human head, all types of skills are manifested in those who have me inside their skulls. I am the light of reasoning and cause people to go to paradise. The question was asked of the second light, it stated “I am modesty, I reside in the eyes and I see the Attributes of G-d.” The third said I am the light of compassion and those who have me in the heart are on their way to an everlasting paradise. Adam choose reasoning to reside in him but the other two rejected that saying “we all go together.” So Adam possessed all the lights. Thus the potential of reasoning, modesty, and compassion resides in all of us, continued Omar. Thus when we become successful by incorporating the three lights mentioned, we have to keep arrogance out of our mind; not allow greed to come into our lives; and stay away from envy. G-d has given us the gift of these lights in order to cultivate our lives with faith and reasoning. We have to un-wrap the gifts that G-d has given us, as great potential. Let us look inward to our own selves and open up that gift, and see what G-d has given us to develop. 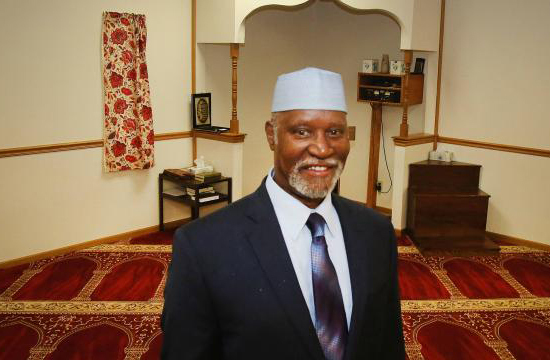 Al Hajj Omar Jaleel Hazim, Imam of the Islamic Center of Topeka Kansas. Went on Hajj with Imam W.Deen Mohammed and a large group of Muslims in 1977. Hazim also went to Mecca twice after that for the occasion of Umrah in 1998 and 2015.